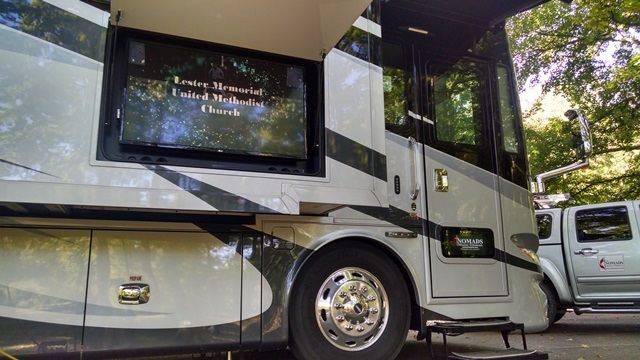 It was another beautiful day in Hernando, MS. We again slept a little late and then did our morning walk, returning to FRED just in time to watch the live stream of our early church service at Lester Memorial. Unfortunately, there was evidently a problem with the stream and it never came in, so we just watched one that we missed a few weeks back. It does appear that the 11:00 service is now up for viewing so we will watch it one day this week. After watching the service we did some more walking around the park and some paperwork. We sat outside and watched the birds and people and lake. It was a quiet, peaceful, restful day. This afternoon we shared a big meal of the day with Dave and Carol. Carol made us a Pennsylvania-Dutch meal. It was green beans, ham, and potatoes. Mmmm good. We provided the salad and we had a bowl of fruit for dessert. The food was good but the conversation with friends better. We moved from the picnic table back to the lakeside where we saw a bald eagle fly by again. It was a good day with another pretty sunset.